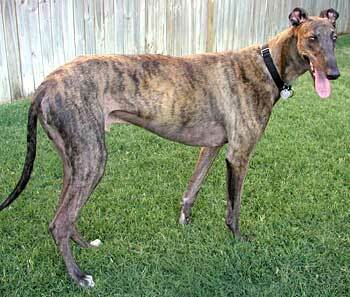 Joey, aka Algoa Bwana, is a handsome 5-year-old dark-chocolate brindle male, born February 9, 2000. His sire is Scott Free and his dam is Flash Coral. Joey has quite a story to tell, and it is one that will touch your heart. Joey was found as a stray in Altus, Oklahoma, with an extension cord wrapped around his neck and a right tibial fracture. Joey's leg was repaired, and he has now been released from Dr. Robert Bertrand's care. His racing career started May 10, 2001, at Hollywood Race Track in Florida, and ended July 31, 2004 at another Florida track, Flagler. The total number of races shown on Greyhound-Data.com is 241. What a contender he was! Joey has quite a playful personality and loves, loves people! It is not known at this time if Joey is cat or small animal tolerant.